active engagement works as a catalyst in the transformation. in proportion to the learner's engagement. e-Learning, or Electronic Learning, is an advancement in Distance Learning based on interactive, multimedia courses which can be accessed through a wide range of electronic devices connected to the Internet. Distance Learning or Distance Education is a way of learning independently and remotely, which does not require instructors and learners to be physically present at the same place and time. Training, educational or learning material is delivered through text, audio and/or video courses. Although in its early days Distance Learning was thought of as an isolated experience with learners enjoying limited interaction with instructors or other students, information technology and online communication systems can now offer rich interactive Distance Learning experiences that may even surpass the interactivity options of a traditional classroom. Also known as hybrid learning or mixed-mode learning, Blended Learning is an intermediate approach to Distance Learning, combining traditional classroom-based and electronic learning complementing each other. A Learning Management System is a platform used to create, distribute and track e-Learning courses. 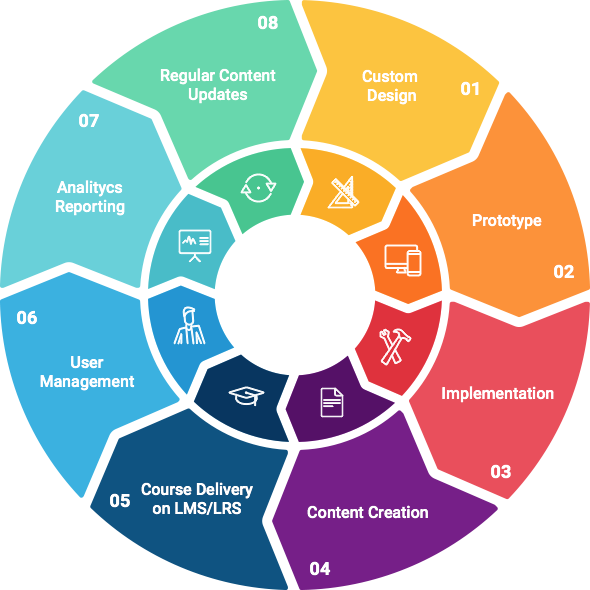 It is designed to support you throughout the training process – from planning, creating or importing learning content to assessing and monitoring learners, passing by managing users and delivering courses. Most LMSs focus on the key elements of Distance Learning: delivery, assessment and monitoring. Some even allow interactions between instructors and learners through forums, communities and videoconferencing. Others offer advanced tools to produce and manage SCORM-compliant content. A Content Delivery Network or Content Distribution Network is a globally distributed network of servers delivering content faster and efficiently, due to the wide spread of its datacenters. This model is particularly effective in speeding the delivery of content for Websites and services with high traffic and a global reach: the closer a server is geographically, the faster the content will be delivered to a user, so a CDN management software dynamically finds the nearest server to the requesting client and rapidly delivers content through it. CDNs can also counterbalance bandwidth issues or sudden peaks of traffic. The Shareable Content Object Reference Model (SCORM) is a set of specifications aimed at encouraging the standardization of learning content, so that it can be shared across different LMSs. More precisely, the SCORM standard defines how learning objects and LMSs communicate with one another, thus granting content durability, reusability and interoperability between e-Learning platforms. A Learning Record Store is a repository for learning records that can be accessed by any LMS, reporting tool or other LRS. Although it is usually a component of a LMS, it can also exist independently. Any learning activity carried out through the Tin Can API or the Experience API (xAPI) - e-Learning standards developed after SCORM - can be stored and retrieved by a LRS. Earlier standards like SCORM can only store simple data such as test scores or course completion and such data stays within the LMS used for that specific learning activity, whereas a LRS makes it possible to share more complex data across multiple platforms, so that learning records can follow the learner anywhere and provide more data points for reporting and analytics. Learning Objects are self-contained and stand-alone content units, used to assemble e-Learning courses: learning content delivered via LMS is usually divided into Learning Objects, content modules made up of text, images, audio or video assets that can be aggregated, used and reused to support one or more learning activities. Gamification is the application of Game Design principles and mechanics to non-gaming contexts in order to boost motivation through competition and to turn boring or complex tasks into easier and funny activities. Gamification aims at driving desired user behaviors by fulfilling our natural need for success, status and recognition, while also tapping into our instinct to compete and/or collaborate to achieve goals. Its applications range from business to education - with the goal of increasing productivity and learning retention respectively - passing by training, marketing, customer loyalty, apps and Website design, health and fitness, public transport and much more. An Application Programming Interface (API) is a set of rules and requirements that allows software programs to communicate with each other and to exchange information. Basically, APIs work as interfaces or interpreters between different applications and/or operating systems, thus facilitating interoperability. They do so by exposing a small portion of a program’s code in order to share specific functions or pieces of data with other programs, without requiring developers to share all of their software’s code. Applied Gaming or Serious Gaming is the application of games beyond entertainment purposes. Although it may actually be fun, its main objective is to educate, train or engage users in marketing activities by simulating real-world events or situations requiring problem solving or decision making. Unlike Gamification, which borrows specific Game Design mechanics and elements such as points, levels and rewards in order to increase motivation and learning retention for educational or business applications, Serious Games are real games. They include educational games, also known as edutainment, technical simulations for testing new or dangerous procedures in a safe environment, business simulations for role-playing on processes or soft skills, advergames and politically or socially engaged games.